I know how much you suffer about the school, but don't take it to heart. Your laboratory will be the real school of Cremona, and I assure you that will have such good business that you won't have time to construct instruments. I encourage you to make a cello out of poplar or local wood, the belly with wide grain, and work this, too, with the scraper to bring out the vein like the sample I'm sending you, which is made like I said; by the way, this piece of spruce is from up there: it's from Latemar; in order to see the effect, look at it against a tangential light; by the way, a note about the isinglass: first one coat, and after it has dried, a little asprella weed or fine sandpaper, and then before the varnish, another coat. Be sure not to leave as much wood on the back as on the belly; make it as if it were a violin; these are the thicknesses that produce a good sound on the viola, and it is also better that you make the angle of the neck 31 mm., because the terrible dryness here will raise it a lot. I embrace you affectionately, always your friend, Sacconi. 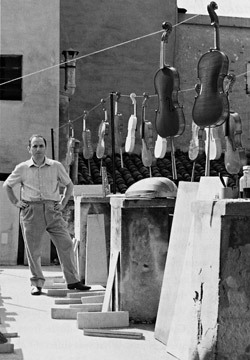 I met Simone Fernando Sacconi for the first time in November of 1958 at the International School of Violinmaking in Cremona, which that great expert had wanted to visit as he passed through Italy. Sacconi had an interest in the School - which had been opened in 1938 on the wave of enthusiasm caused by the celebrated Exhibition of 1937 for the Stradivarian Bicentennial that Sacconi had helped organize - since it was he that had been asked at the very beginning to be the director. Although he had not been able to accept the position (in fact, he had moved to America just a few years before, and had important work to do there), he still had a particular interest in the welfare of the institution. I remember how I was struck by his thoughtful, intense look the minute I saw him; I had the impression of being before a man of great personality, a real artist, because of the way he expressed himself, his speech and his bearing. At that time I was no longer a boy; I already had a wife and three children, and Sacconi asked me why on earth I was studying at that school. I explained to him that, having begun at the age of nine to study first the violin and then woodcarving and inlay as a dilettante, and having already tried to make a violin by myself, I felt very drawn to violinmaking, an art which I knew would help me understand this fascinating musical instrument better by adding the techinque of its construction to my knowledge. 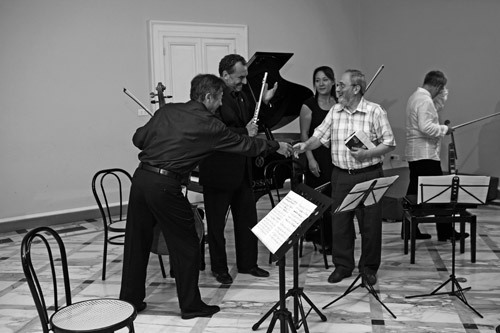 Sacconi, after having observed some of my first violins, realized that even though they were still rough and imperfect, they showed that I had gained manual dexterity and familiarity with the tools. In essence, he saw that I had potential and proposed that I move to the United States to work with him at the Wurlitzer Company in order to perfect my techniques in the construction of new instruments and to learn restoration. It was a very inviting prospect for me, but in spite of all his insistence I was unable to convince my wife, as she was too attached to her home territory and to our children, who were still very little at the time. Then he suggested for me to go ahead alone and said he would find me a house so that after a year or two my wife and children could join me, but it was useless. In the end he said, "Never mind. Even if you can't come to the United States, don't worry. You'll see that one way or another we'll manage to keep in contact all the same. We can write to each other, and I'll come back to Cremona from time to time." This great willingness of his to help me with his experience and advice gave me incredible enthusiasm and energy, and from that moment on, I began to see good prospects for my work, feeling certain that I had his priceless support. 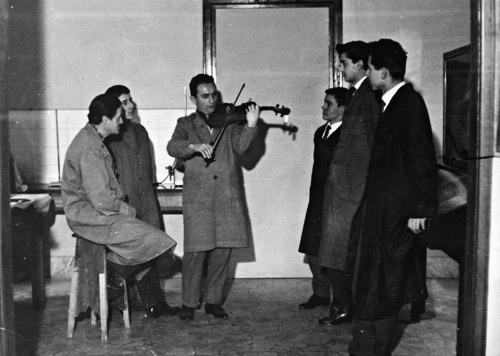 Sacconi came back to Cremona in 1962. In the meantime, I had already earned my diploma and had opened a little shop in via Ala Ponzone, right near the Impero Hotel where he took a room. I remember his suggestions as to how to arrange the shop better, and how to equip and furnish it. Then for all forty-five days that he stayed in Cremona, my shop became his, too. I gave him a copy of the keys, and he went there to work, even outside work hours. Often when I got there in the morning (around 7:00), I found him at the bench, where he had already been working for over an hour. In spite of the fact that he was terribly busy with musicians and collectors that came from all over Italy to show him classical instruments or to have him adjust them, he always found the time to carve a scroll, finish a belly, or cut a bridge, and he did everything with maximum concentration. He was so dynamic, and his capacity for work and physical resistance were formidable; he was never tired, he never sat down, he was always thinking, always working, always on his feet... And he was a born maestro; he had such a capacity for teaching and explaining things that he made them simple for you, almost obvious. The attention, human kindness and sensitivity that he showed me were really limitless, so much so that my wife and I thought of him and treated him as a member of our family. 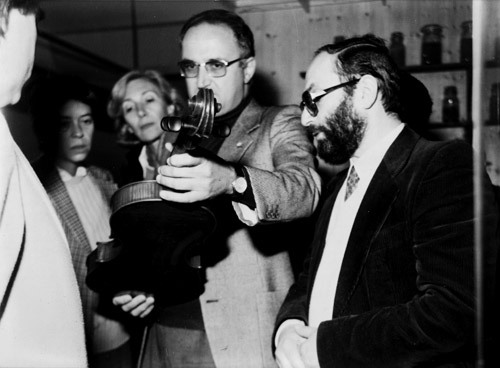 In 1962 I also began working with him on the rearrangement of the Stradivarian Museum, then called the Museum of Organology, which was located on the third floor of the Palazzo dell'Arte in Piazza Marconi. This was a most unhappy location, and Sacconi wanted to have everthing moved as soon as possible, because among the various disadvantages, the excessive cold in the winter and terrible heat in the summer were most harmful for the Stradivarian relics in the museum. I remember Sacconi's dismay when he saw the moulds and tools all dirty and dusty, with numbered oval labels glued directly to the wood, moulds and designs without any explanation whatsoever, displayed in temporary fashion in maladapted show-cases; everything denoted negligence and disinterest in the relics, which he, on the other hand, considered most precious as the starting point - along with the antique instruments - for the development of a modern, high-quality school of violinmaking modeled on that of the classical Cremonese masters. And he said, "I don't understand. You have all this gift of God, you have here Stradivarius's moulds, which are the basis of a school of violinmaking like that of the antique masters, and not one of you has ever come to this museum to study, to try to understand, to keep it alive." I intuited the profound significance of these words of his, and since then I have dedicated myself to a constant effort to put to good use the great school of violinmaking of the past and to encourage the adoption of the internal mould in the construction of new instruments. As we rearranged the material - above all, some of Stradivarius's moulds, which were so dirty that we were unable to decipher the original dates he had incised with a chisel - Sacconi continued to insist that I take responsibility for the whole job, and that I carry on the work even after his departure from Cremona. The reorganization of the Museum was a daily preoccupation for him. Once it was put in the best order possible, thanks as well to the help of Dr. Bruno Dordoni and the acquisition of new display-cases on the part of the city, the Museum was moved temporarily to the Manfredini Hall of the Affaitati Palace, and then to its present location in via Palestro, where it was again reorganized. Today it is once again located in Manfredini Hall. 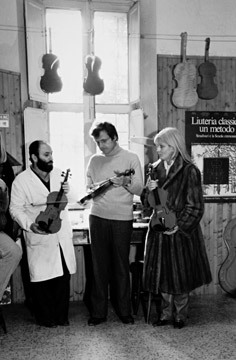 The days I spent in the Museum of Organology with Sacconi were fundamental to my activity as a violinmaker. His continuous explanations and his reconstruction - through a study of the moulds, designs and tools - of Stradivarius's work processes took me back in time and made me feel almost as if I were in the great maestro's shop. I became so familiar with him, it seemed that I had always worked beside him elbow to elbow. 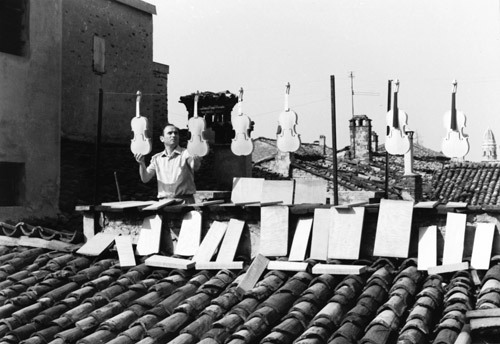 Sacconi was extremely familiar with those relics, because having been a pupil of violinmaker Giuseppe Fiorini, he had already seen and studied them before Fiorini donated them to the City of Cremona. 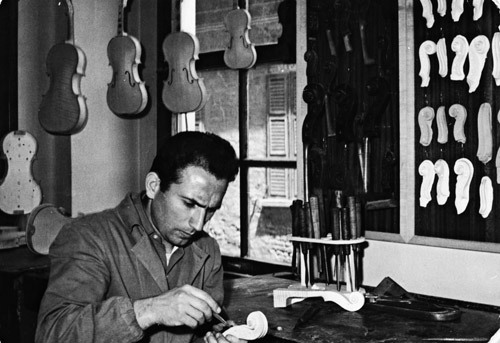 Sacconi was crazy about Stradivarius, whom he considered to be the supreme synthesis, the apex of the antique school of violinmaking. Those moulds and designs - the only ones left today (in fact, nothing similar has come down to us from the shops of the Amatis, Guarneris or other great makers - were for him living testimony of the sublime art of that insuperable master. It was through those experiences in that Museum that I understood the importance of constructing instruments according to the method the great Cremonese masters used: the internal mould. Sacconi kept repeating to me, "You see, Francesco, in order to go ahead in violinmaking, we must go back into the past and understand what they did then; only after having studied and understood Stradivarius can one become a good violinmaker. It is really difficult to construct instruments according to his method, which takes a great deal of concentration, patience, and perseverance, but with time it allows one the possibility of giving one's best. To work with the internal mould, in fact, requires not only manual, but also intellectual effort, a capacity for creation and invention which calls into action the whole personality of the violinmaker". In any case, Fernando came back to Cremona quite often, almost every year, and he spent many of his customary visits of 45 to 60 days in my laboratory. What a quantity of information and knowledge I assimilated from him, even through his talks and exchanges of opinion with the clients! Sometimes he would go to the School of Violinmaking, where he gave advice and suggestions to the students, but he was not always appreciated as much as he deserved. Towards the end of the 60's he also gave an important three-week course on restoration, which was attended not only by the students of the School, but also by a number of violinmakers who had come from all over Italy (there were about 25 of us, counting the professionals and the young people, if I remember correctly). It was an extremely interesting course from a technical point of view, especially because Sacconi had no secrets. He explained all he knew, anything he had experienced. In eesence, he gave everything he had to everyone. While he was at my shop, a few times we managed to find a couple of hours to go together to the Civic Museum to look at the paintings, sculptures and inlaid works. We also went to the Cathedral to study the inlays in the Choir, created by Plàtina at the end of the fifteenth century; these inlays were protected by a type of colorless varnish which, according to Sacconi, was the same that was later to be used with the addition of dyes by Amati, Stradivarius, and Guarnerius. He was convinced that the ingredients and composition of this varnish were the same as that of the great violinmakers, and that they had, in fact, inherited this composition from the inlayers. He took a bit of cotton with a little cleaning fluid, ran it over a corner of one of the inlays, and had me admire the beauty, transparence, and sheen of the varnish, still almost completely intact after centuries. He also took me to the Church of Saint Sigismondo to study the masterpieces of the Capra brothers in the Choir, carvings which, according to Sacconi, had also influenced the scool of violinmaking of their time (the end of the 16th and beginning of the 17th centuries). He involved me in all this research with such passion and incredible competence that one could see how much he loved and knew about arts other than violinmaking - painting, sculpture, etc. However, every discourse wound up being directed towards his fixation: the violin. Those were for me unforgettable, fascinating, fundamental lessons. I could have listened to him, for hours without ever feeling tired. On one of his later Cremonese visits, in 1968, I was fortunate enough to help Sacconi regulate the 1716 "Berthier" Stradivarius, which belonged to Engineer Paolo Peterlongo. The instrument remained in my laboratory for several days, during which time Fernando described and explained to me every minute detail about it with startling surety and immediacy, as if he had always had it before his eyes. He treated all the other antique instruments (Stradivariuses, Guarneriuses, Amatis, Bergonzis and others by lesser makers) with the same great familiarity and certainty when musicians and collectors brought them to him in my shop for little repairs or for a simple adjustment. He explained to me the history, the particulars, and the aesthetic and acoustical characterstics of every one, too. 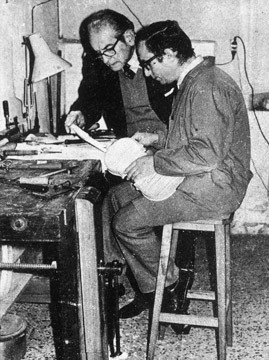 In 1971 I moved my laboratory from via Ala Ponzone to Via Milazzo - (since 2001 the workshop has relocated to Piazza S. Paolo) - and there Sacconi had more space at his disposition during his last two visits to Cremona (1971 and 1972); he had a workbench all his own, and his tools, to which he added the utensils he constructed expressly to have ones just like those Stradivarius used. 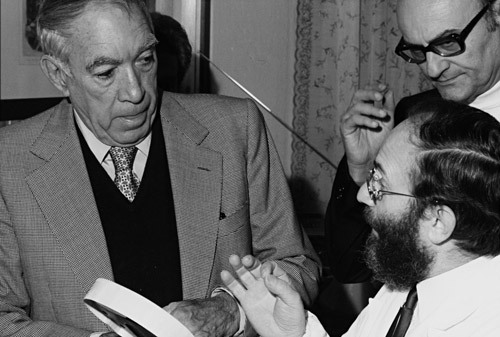 My laboratory had become like a second home for him: he stayed after hours to talk with clients; almost every day he received Dr. Bruno Dordoni, with whom he was writing up his book, The ‘Secrets' of Stradivarius; and he ran all kinds of experiments, especially on varnishes. I remember a long list of resins and solvents that I had to procure for him so he could prepare a new varnish that he wanted, similar to that Stradivarius used. I went as far as Soresina to a beekeeper I knew to have him scrape the hives for propolis, a gummy substance that the bees produce to close the openings of the honeycomb, and which Sacconi considered indispensible to the preparation of a good varnish. Once I had procured the ingredients, we made experiments together using several formulas for varnish, one of which he later described in his book. Among the other experiments we made, I remember the reconstruction of the process of extraction of red dye (alizarina) from madder roots, a typical coloring matter used in the classical Cremonese varnishes. 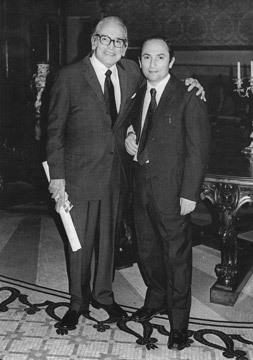 In 1971, under his supervision and with his constant help, I began the construction of a violin modeled after the 1715 "Cremonese" Stradivarius, preserved in the City Palace of Cremona. First he had me construct the internal mould on the basis of the measurements of the one preserved in the Stradivarian Museum. Then we went to the City Palace - many times - to study the original Stradivarius and observe the arching, the purfling, the modeling of the corners, the carving of the scroll, etc. We went together after that to choose the wood, which had been extremely well seasoned and had marbling very similar to that of the original. At that point I began the real construction of the instrument with him. I remember how meticulous and precise he was, and how secure in guiding me through the various phases of the construction. For me it was a great first-hand lesson in violinmaking that I still remember with enthusiasm and gratitude. 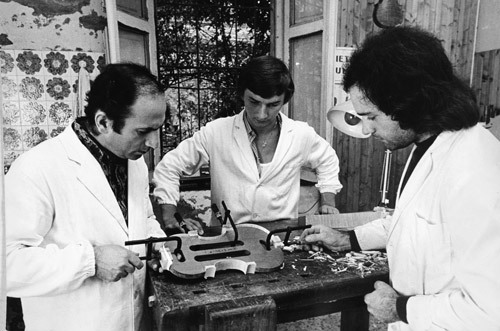 The violin, which was finished in 1972, was left in the white because he wanted it to be exposed to the sunlight for several years before being varnished. Unfortunately, he didn't have much time left, and missed the joy of seeing it varnished. Sacconi was a vital figure for me. He transmitted to me a wealth of experience and knowledge that I would never have been able to acquire in another way or from other sources. In addition, he was not just a teacher, but above all a great friend, an upright man, generous even to excess, with faith in the capacity and potential of every person. Although he was great, and conscious of the fact, I never heard him criticize or blame anyone when he confided to me his judgement of his students; instead, he always tended to emphasize even the smallest show of talent. He lived entirely for his work, with passion and enthusiasm which were part of his unlimited love for life, for creation, and for research. Violinmaking, rather than being a pretext for prestige or material gain, was for him simply an act of love. For this reason, even before I acknowledge my respect for Sacconi the expert, I pay homage to the great maestro of life. I was so glad to receive your letter of the 3rd of this month, and to learn of your move in Cremona. On the 30th I sent you a package of things that will be useful to you. The small planes have been ordered, and I will send you some as soon as I get them, together with the bridge jack. The viola bridge jack is one that I used for many years. Now let's get to the supposed "Guarnerius" cello. Perhaps this instrument has replaced a real Guarnerius, and is instead an Anselmo Bellosio of Venice, who was a pupil of Santo Serafino; I don't know who made that change or how: the label has been remade, and the date 94 has been copied from a long label (of which I'll send you a photocopy) from a viola that belongs to the famous violist Primrose. The copied label belongs to the period around 1682, as you can see in Hill's book on Guarnerius; and then you will notice that they also made a mistake in the spelling (they left the "m" out of alumnus). Another characteristic is that the Guarneriuses didn't make such a clean cut at the end of the throat of the scroll ... whereas Santo Serafino and his pupils had this characteristic ... and perhaps Bellosio did it like this too, sometimes ... and then there are many other characteristics that I can't list here. My advice would be that you repair and sell it as an Anselmo Bellosio, because if you sell it as a Guarnerius, you may run into trouble. Another thing I forgot to say: the Guarneriuses never made such small cellos, but Bellosio did. ...The color of the varnish is right; you just have to put some wax in it: 4% of the resins, so it will be less glassy, and a little propolis, if you have some; it will give you a beautiful yellow. Made expressly for the Rembert Wurlitzer Company, Inc. The purfling of the Gasparo is very good. The borders of the Testore are fine; those of the Gasparo you can flatten on the side of the ribs ... and make the mortices of the ribs at the corner blocks more at an angle, like this:... these are characteristics details. Don't overdo it with the thicknesses of the belly and the back - make them like I told you. What you did to bring out the grain of the belly is too pronounced in certain points. If you want, you can use sandpaper or fine sharkskin first, and then go over it again with the scraper along the grain of the wood; but don't exaggerate; and when you varnish it, use a lot of varnish, because otherwise when you smooth it, you will remove the varnish from the ridges of the wood, and make them come out white.